I was so excited to see that Kristina Werner had extended the deadline for her Color Inspiration Challenge #31! I haven't been able to play along since I started working, and the extended deadline gave me the extra time I needed. 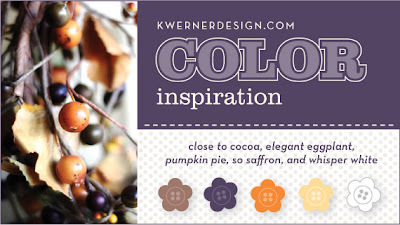 Kristina's colors this week are CLOSE TO COCOA, ELEGANT EGGPLANT, PUMPKIN PIE, SO SAFFRON, and WHISPER WHITE. GREAT color combo!!!!! I tried to play off of the inspiration photo of the autumn wreath. The Dew Drops (non-SU) added the dimension I needed for the large stamped image (Season of Friendship) and resemble the berries on Kristina's wreath. The circle paper piercing on the 1 3/8" Close To Cocoa CS was done using the Priceless Classy Brass Template, and the Punches Plus Classy Brass Template was used to paper pierce the So Saffron Scallop Circle. I used a Corner Rounder to round the corners of the sentiment from Holidays & Wishes. This is so pretty! Love Kristina's colors on this, and the dew drops are the perfect addition! WOW--this is gorgeous!!! Love the dew drops!!! And, the colors really look great with this set!! This is beautiful. Great take on the colour challenge. Amazing card! The receiver is going to be one lucky person! I love the tree and I love those drops on there. Fabulous card, Nancy! I love the piercing on the scallop circle - thanks for reminding me about that classy brass template! It's lovely! I just heard that plum and mustard are the "new" colors for this spring! You're ahead of the game! I LOVE the way you've used these colors here! Just a perfect amount of each! Beautiful! I LOVE this card! What an excellent concept! I've just discovered Kristina's blog & have found much inspiration in it. I hope you'll participate in more of her challenges. I LOVE what you come up with! Love what you did with this card and your use of this set. All the little details set it apart! Gorgeous Nancy! This is fast becoming a favourite stamp of mine...hehe! LOVE the colours and your layout...it's fantastic as always my friend! Stunning card, Nancy! The tree is beautiful in these colors. Your details enhance beautifully, especially the circle piercing. You've inspired me to get those brass templates out and use them. wow, Wow, WOW! Nancy, this is fantastic. Love the dew drops on the tree - such a fun little touch. Nancy, I love the colors you used on this fabulous card!!! Totally inspiring! This is absolutely beautiful. I love the amber colored beads on the card. This is one of my favorites. Award : " I love your blog"
Beautiful card! The dew drops are great. TFS, Amy. Nancy, this is just stunning. I love the extra touch of the dew drops, and the details of the sentiment. Colors turned out beautifully! Nancy, I just love your blog! You've got so many great ideas. So I'm nominating you for a Kreativ blog award. See my blog for details. PS Still wating to see if you won on Shelli's blog for the past month. Great card! Love the backing for the sentiment! This is FABU Nancy...just like YOU! Another stamp set I need to buy!! Gorgeous card - I love all the different dimensions and layers!! Nancy, I love your card! The crisp colored-leaves against the white is just so yummy! What a beautiful card Nancy! I just LOVE the fun design and the warm colors of fall!! Great card! I love the dew drops! Wonderful touch! I just got this set! Now I really can't wait to use it! Nancy, I have seen alot of beautiful cards with this set but yours is one of my fav's! Love the colours and how you used them! This card is just beautiful. I love this set. I keep putting off purchasing it, but I think it will need to find its way onto my next order. You are so talented. Thanks for sharing. GORGEOUS Nancy!!! I absolutely LOVE it!!! I don't have that stamp set yet, but this has convinced me I need to put it on my next SU order!!! Wow! you have an amazing blog - really lovely. Your card for the color challenge is wonderful! I love this stamp set that you used and the dew drops look great! It really does look like Kristina's photo for the challenge! Beautiful! Love the dew drops and the piercing...I keep telling myself I don't need that template, I don't need that template, but I do!! What a great color combo! Love the dew drops added to the branches and your layered sentiment...and the...OK, I love it all! This is amazing Nancy! Gorgeous, gorgeous fall colors, wonderful dew drop accents and that layered flower sentiment is sensational!